Optimize your site for your users, but also for search engines. In a normal or better ideal case these goals are identical. However, since algorithms (so far) can not simulate the complexity of human actions, there will be a discrepancy between humans and algorithm, so: Optimize your page for users AND for search engines like Google and Bing. A SEO consultation of ivisory is comprehensive and is based on thorough analysis and a clear procedure. 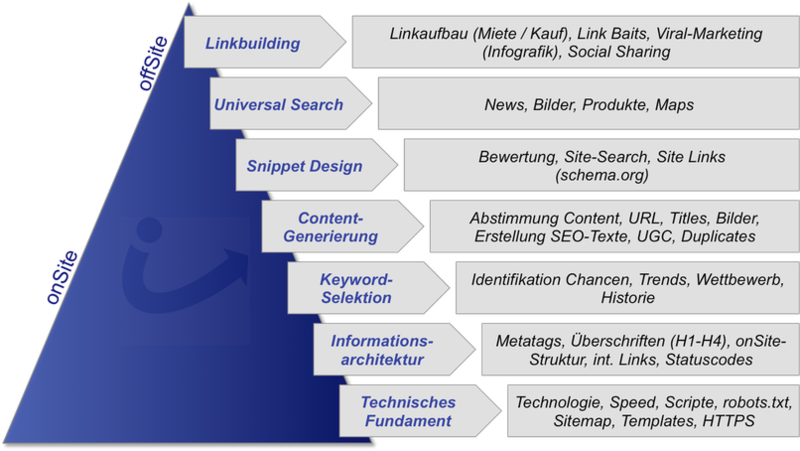 We are using our ivisory SEO Pyramid with its seven factors for sustainable success in search engines. The technical foundation must be right, the page must be accessible to Google Search Bots. In addition to load times, queries, templates, leading Google through the sites is important, e.g. with the robots.txt file and a sitemap.xml. Some metatags are useful, others useless. The combination of these tags with other topics such as URL and headings is crucial. Again, Google should be actively led by status codes and not blocked by an unclear structure. What keywords are useful, which absolutely required? Through regular keyword research, potential is derivable and achievable. Based on the keyword analysis, the content creation is done on appropriate topics. Again, the created text should not exclude users but more importantly: To be understandable for search engines. The display in the search results (snippets) can and should be optimized as well. Length of the texts, sitelinks or a page search are examples of useful and value-adding activities. Depending on the business model it is possible to work in Google’s universal search. Product Search has become more of a topic, which requires a payment, but all other topics such as pictures, maps and news are controllable by SEO and are for free. As long as on-site SEO is pushed and is well positioned, flanking it with link building can be started. Strong sites, viral actions, or external links to your own site are ways to appear more attractive. This is officially no variable in search engine algorithms. Well, then again … it is. In addition to SEO, we also offer Search Engine Advertising (SEA). Here you can find out more about our offer and procedure at SEM.